At the bottom of this webpage are links to graphical interactive databases of fluorophores and filter sets. Before purchasing reagents or staining samples, it is imperative to make sure you have a microscope with hardware that can image the probes. In general, microscopes have fixed wavelength filter blocks for imaging fluorescence. Typically, these do not include Alexa Fluor 594 and a new generation of near infra-red probes. But some microscopes do have these capabilities. Check before doing the experiment. This table shows the most common filter block availability and, in general, probes that work well. Before you label your samples, it is best to check that the microscope you need to use has the hardware to match the reagents. Most probes are excited at 405, 488, 568, and 633 nm with short Stokes shifts such that the emissions are detected in the next longer wavelength range (violet to blue, blue to green, etc.). This is standard and the table lists many of the common probes. This is complicated by the 405 nm lasers on confocals. Some of the blue probes for widefield fluorescence that work well with Dapi filter block do not work on the confocal. For instance Alexa Fluor 350 works well on widefield fluorescent scopes, but does not work at all on the confocal microscopes. Alexa Fluor 405 is ok with widefield scopes whereas ideal with 405 nm laser using confocal. A few probes have longer Stokes shifts. For instance, look at Brilliant Violet series of probes. They all excite in the 400-420 nm range but emit at different colors all across the spectrum. One wavelength, such as a 405 nm line on the confocal, can excite multiple emitting dyes that have easily separable emissions such as blue (Brilliant Violet 421), red (Brilliant Violet 570) and near infra-red (Brilliant Violet 711). Used in combination with the shorter Stokes shifts probes, specific labelling of more than 4 molecules can be imaged in sequence without complex spectral deconvolution. I would recommend trying one that emits within the window of 550 to 740 nm. Beware trying to use with Dapi as emissions shorter than 600 nm might have dapi spillover. Also, standard confocal cannot detect longer than 750 nm. EXAMPLE OF FIVE PROBES WITH ROOM FOR A SIXTH HERE. This uses Pacific Blue and Pacific Orange. The Brilliant Violet probes do not work on fixed filter block systems such as the AxioObserver and Evos, but do work with the the Nikon widefield and spectral confocals (710, 880, and Leica SP5/8). Alexa Fluor 594 does not work on the 710 and widefield scopes, but works great with the 880, and Leica SP5/8. Please consult with us for other special combinations, for instance dyes that excite at 490 nm but have a long Stokes shift to emit in the red or far-red. Also, there are a lot of options not listed here and a few other ways of generating contrast such as reflection and harmonics in multi-photon. According to https://www.aatbio.com/spectrum/ and discussions found on the web, Hoechst 33258 and 33342 will not work with the 405 nm laser on the confocal. However, Hoechst 34580 has a redshifted absorption and will excite with 20 to 30% efficiency. 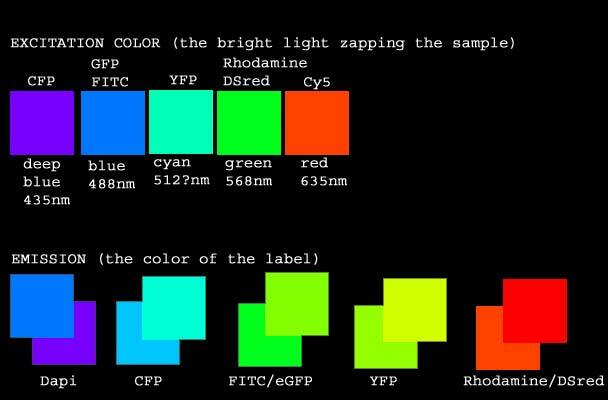 When I first wrote this webapge back in the late 1990s the table above defining fluorescent probes for microscopy broken into four colors was accurate for how all our microscopes were configured and for the majority of fluorescent probes available to the biological researcher. The table remains useful as a broad outline; however, there has been an explosion of fluor probe development for use by the biological researcher so by no means does the table list all available probes nor are all our microscopes limited to four narrow bamds of detection. The table, which used to be exhaustive with a small number of molecules, is now merely a rough guide. What remains the same is that a researcher should look at an instrument's imaging capabilities before investing in probes and should be prepared to be flexible with probe choice or understand how instruments may need to be modified. One example, AF750. Confocals (in general) cannot detect light above 750 nm. Many traditional light sources. New filter blocks chromatic aberration. conflicts with other optics such as heat filters or autofocus using lasers 760 nm or longer. If you have experience with these, please let us know! We occasionally get questions about Alexa 700 and similar near-IR dyes. We do not have the filter blocks for any of the widefield epifluorescent scopes. The confocals (depending which one) only detect below 700 to 740 nm. And even if they did, users would have to change focus due to chromatic aberration. Also, we do not have the correct excitation lasers. Custom filters can be purchased, there may be more filters available since this web page was last updated, and a few of the confocals have customizable spectral detection. Aggregated data of filters combined with fluorescent probes based on this article which explains how could be extended to include the spectral sensitivities of the entire light path. And Google and Bing are your friends to look for other specific spectra.